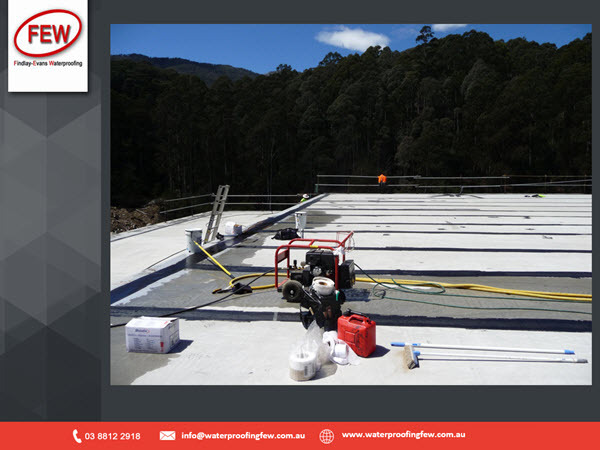 Findlay Evans Waterproofing was contracted to apply and install the concrete rooftop waterproof membrane for an environmentally sensitive power station in Melbourne. AGL Mt Bogong Power Station, the largest hydroelectric asset built on mainland Australia for more than 25 years, is located in the upper catchment of the Kiewa valley. This is an extremely environmentally sensitive location and presented many challenges. To reduce the impact on the surrounding area, the final power station structure is almost entirely buried and re-vegetated. The waterproofing s product and method had to conform to these requirements. F.E.W Waterproofing are proud to be the specialist waterproofing contractor on Award Winning project at AGL Power Station. Findlay-Evans Waterproofing provided a seamless monolithic waterproof membrane which is ideal for roof applications. Our system is fast to apply and meets all the requirements of health, safety and environmental issues. It is up to 750% elastic to expand and contract with the roof surface. Liquid Rubber can be used in many waterproofing applications and its low cost and versatility has made it one of the most sought after materials in the roofing industry. Suited to almost all common types of industrial roofing; including corrugated fibre, aluminum, steel, concrete, timber, asbestos, bitumen and can also be applied over failed sheet membrane systems.